Cathedral Lake is a lake between Tuolumne Meadows and Yosemite Valley in the Yosemite National Park. 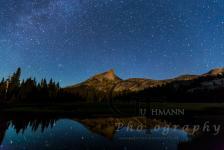 From Tuolumne Meadows it is a short day hike to Lower Cathedral Lake. Take your tent with you to get a little bit of sleep beside watching the stars. Watch out for reflecting eyes in the light of your headlight because it's bear country.